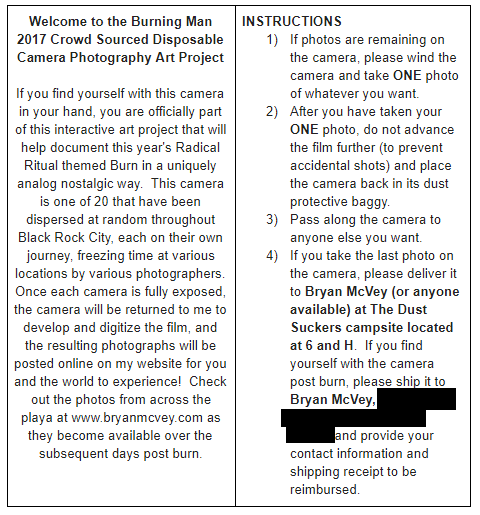 Crowd Sourced Disposable Camera Project — B.M. Starting in 2017 I began a photography project where I handed out 20 disposable cameras in plastic zipped bags throughout the week to mostly random people. With each camera, there was an instruction card in it, explaining to the recipient to take one photo and then to pass the camera along to the next person. Once the camera was fully exposed, the directions were to return the cameras to me by either leaving it in my camps mailbox or by mailing it to my home address post burn. I received one camera mailed to my home address in 2017. 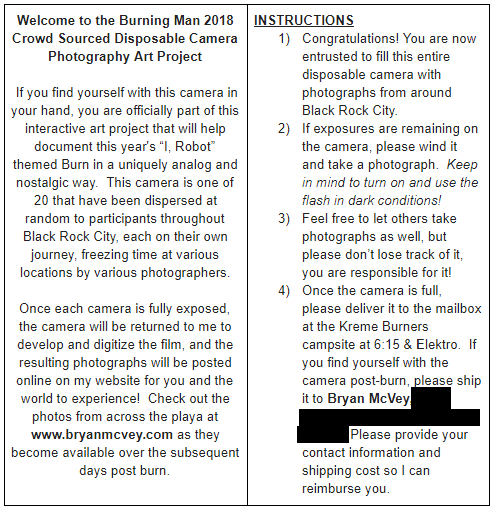 In 2018 I modified the instructions so that each recipient was responsible for the camera until it was full exposed, allowing for others to use it, but explaining to the recipient to not lose track of it, as they were responsible for it from first the first image to the last. I am looking forward to continuing to expand this project so the results improve in future years, but until then, the following galleries are the 3 camera’s images spanning the 2017-2018 burns.